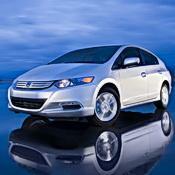 The Honda Insight is a 4-door, 5-passenger family sedan, available in 3 trims, ranging from the LX to the EX w/ Navigation. All trims are equipped with a standard 1.3-liter, I4, 98-horsepower, hybrid engine that achieves 40-mpg in the city and 43-mpg on the highway. A variable speed automatic transmission with overdrive is standard. The first-generation Insight was produced from 2000 to 2006 as a three-door hatchback. This is my 4th Honda and my favorite so far! I love the mileage, of course, but I also love the comfort. The seats are more comfortable than my Civic and just as much leg room. None so far but have only had for 2 weeks. It does have the same mud flaps I did not like on my Civic - kind of cheap! Overall this car has exceeded my expectations. I wanted the better mileage but did not expect to love this car as much as I do. I love how it looks and have gotten quite a few of my fellow teachers stopping to look at it in the school parking lot!